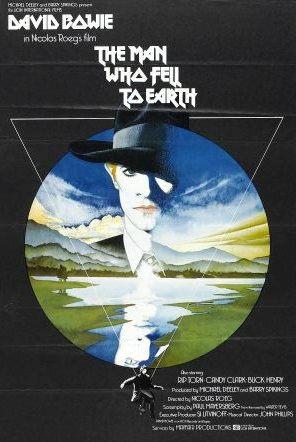 Forty years after its initial release, a re-mastered version of Nicolas Roeg’s sci-fi classic The Man Who Fell to Earth returned to cinemas last week. The story follows extra-terrestrial Tommy Newton, played by David Bowie, as he makes a journey to earth in order to try and harness resources for his dying planet. While here he patents the designs for some revolutionary intergalactic technologies that subsequently turn him into a corporate giant. With his acquired wealth, he attempts to build a ship that will carry him back to his old planet but rival forces conspire against him and he is made a prisoner of his own success. David Bowie is perfectly cast as the vulnerable and other-worldly protagonist and despite his obvious limitations as an actor he succeeded in capturing the innocence, naivety and mystery of the forlorn alien Newton as he longs for his lost family and readjusts to life on a foreign planet. Considering the relatively minimalist nature of Bowie’s performance, there are a wealth of much-needed small details which add to the intrigue of this character. Be it his ability to watch ten TV’s at once, his penchant for straight gin or his eccentric business ventures; Newton infects the world around him with his own curious magic and wonder in a compelling fashion without which the movie would be much less intriguing. This is partly because the film moves along in such an incidental fashion with no real thrust or momentum with which to carry the story of this wayward traveller. It subsequently has the curious affect of presenting scenes and developments in a detached manner that offered no hint of where the movie might be heading and with no real reflection on the reason these events are happening. Consequently, there are more than a few strange and sudden narrative leaps that leave the audience feeling confused and out-of-joint. The director Roeg implemented a similar story-telling technique in his brilliant horror classic Don’t Look Now (1978); but the much simpler and modest plotline of that film leant itself more conveniently to an impressionistic portrayal whereas The Man Who Fell to Earth should have required a bit more control and editing in order to let the story unfold.